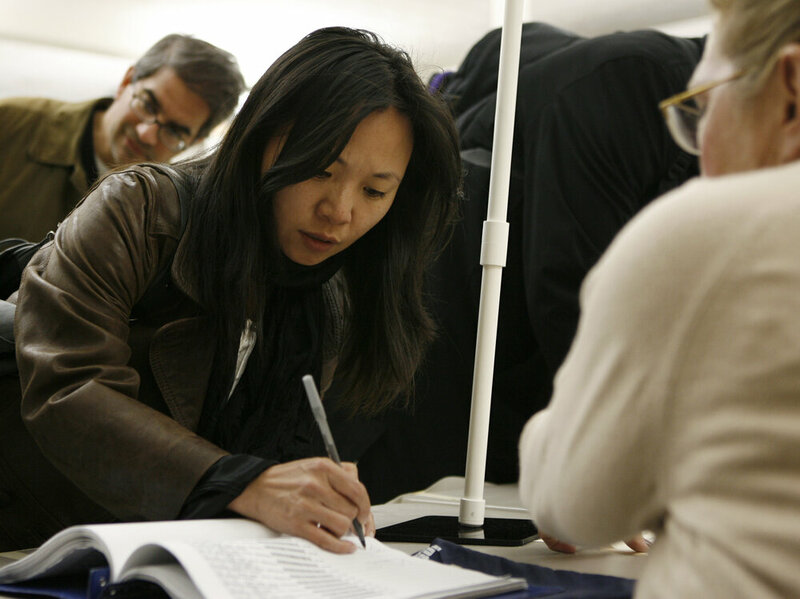 Tanya Lau signs in to vote at the Chinese Community Church in Washington in 2010. Voter turnout has been low among Asian-Americans in recent elections, but a new superPAC hopes to increase it. Asian-Americans are a bit of a voting paradox. They’re the fastest growing minority group in the country, but they’re also the least likely to vote. “This fund is dedicated to really, at this point, one singular objective — and that is: How do we mobilize the Asian-American Pacific Islander community?” said Shekar Narasimhan, chairman of the AAPI Victory Fund and a Democratic political operative. Our community doesn’t get it in some ways, we don’t understand the power of our vote. He says he’s also focused on electing a president who shares the community’s values. The founders have deep ties to the Democratic party, and the fund is left-leaning. They say they’ll support a specific candidate after the nominating conventions, but their current focus is energizing Asians to vote. The Asian-American electorate is small — in 2012, Asians made up just 3 percent of the electorate — but they have sizable populations in key battleground states. The AAPI Victory Fund is not focused on traditional superPAC activities like TV ad buys, but instead, it’s laser-focused on a simple data-driven task: increase voter registration in six states where the Asian population is potentially larger than the margin of victory — Ohio, Virginia, Nevada, North Carolina, Colorado and Florida. Only about 56 percent of eligible Asian-Americans nationwide were registered to vote in 2012. That’s less than every other racial/ethnic group: Hispanics, blacks and non-Hispanic whites. “Our community doesn’t get it in some ways, we don’t understand the power of our vote. We’re under-registered in every one of the target states we have selected,” said Narasimhan during a press conference launching the fund at the National Press Club on Thursday. He was accompanied by Democratic Sen. Tim Kaine from Virginia and Deputy Secretary of Labor Chris Lu, who is known as one of the highest-ranking Asian-Americans in the Obama administration. The fund is trying to increase the voter registration rate by 8 percent in each of its target battleground states. It then wants to mobilize Asians to vote for a “progressive” candidate, by focusing on three issues where they think the disparate Asian community would align: immigration, education and civil rights. That last part is tricky because although Asian-Americans have voted Democrat in recent presidential elections, they’re highly unaffiliated. Nearly half consider themselves politically independent. In the 2014 midterm election, the GOP actuallywon the Asian vote over Democrats, though narrowly (50 percent to 49 percent). These days, the RNC is actively recruiting Asian voters in some of the same battleground states the AAPI Victory Fund is targeting, such as Nevada and Virginia. But, the founders of this new superPAC suggest the tone of the current campaign, particularly around immigration, could unify the Asian community toward a more progressive candidate. “We have heard some horrible things this election season. There is a frankly, shocking narrative of division, absolute hate and total bigotry,” said AAPI Victory Fund co-founder and California tech entrepreneur Dilawar Syed. Both Syed and Narasimhan say the only way to counter the rhetoric is to convince more Asians to vote. Historically, politicians and campaigns haven’t tried very hard to mobilize the Asian community much — it’s challenging and expensive. For starters, there’s no Univision or Telemundo for Asian-Americans — they speak many different languages, and come from 20-plus countries. The AAPI Victory Fund says it will start with $100,000, but expects it will need “several millions of dollars” to do this work. It’s hoping to raise the rest of the money from fellow Asian-Americans, including at a secondary launch in California’s Silicon Valley at the end of the month. This entry was posted on Wednesday, January 27th, 2016 at 5:56 AM and is filed under ISSUES, NEWS, Politics.